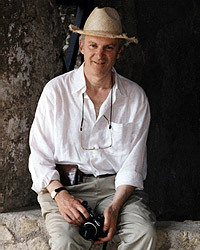 Robert K. G. Temple (1945- ) is the American bestselling author of The Sirius Mystery. In it he supports the idea of extraterrestrial influence on human cultural development, citing as evidence, the ‘knowledge’ of the Dogon people regarding the Sirius star system before verification by modern astronomy. This idea has now come under serious attack with the claim that Sirius C does not even exist(c). The controversy is still raging as the Bad Archaeology website demonstrates(d) as well as an article from the Armagh Planetarium website(e). He contends that this interaction took place between 5000 and 3000 BC and refers to that era as the ‘Contact Period’. He goes further and claims that these ‘visitors’ were responsible for the building of the Sphinx and the pyramids and that later efforts by the Egyptians to build other pyramids on the same scale failed. However, some of the Mayan pyramids are equally impressive although built later than the magnificent Giza monuments, but Temple does not explain the source of the Mesoamerican structures. In 2000 Temple published The Crystal Sun in which he outlined the evidence for early optical science, including its possible use in the lighthouse at Pharos(f). 2013 saw the publication of Ancient Glass by Prof. Julian Henderson in which he pushes back the earliest production of crude glass to the middle of the third millennium BC. Temple has a degree in Oriental Studies and Sanskrit from the University of Pennsylvania. He has written a number of sometimes controversial books on various historical subjects(a). Jason Colavito has cast doubt on Temple’s academic credentials in a September 2012 blog(b). However, it was not until his 2010 book, Egyptian Dawn, that he touched on the subject of Atlantis. In it declared that the “true ‘Atlantis’ was the Atlantic Coastal civilisation of the megalith builders.” He further proposes that the story of Atlantis was concocted by those megalith builders “for consumption by the people of the Mediterranean, as a kind of disinformation campaign.” Temple has hinted that he may devote an entire book to the subject of Atlantis sometime in the future!